I hope this newsletter finds you well. Thanks to you, our wonderful Neighborhood Council leaders, as well as to our amazing staff, we partnered with our City family to do some outstanding work this year. 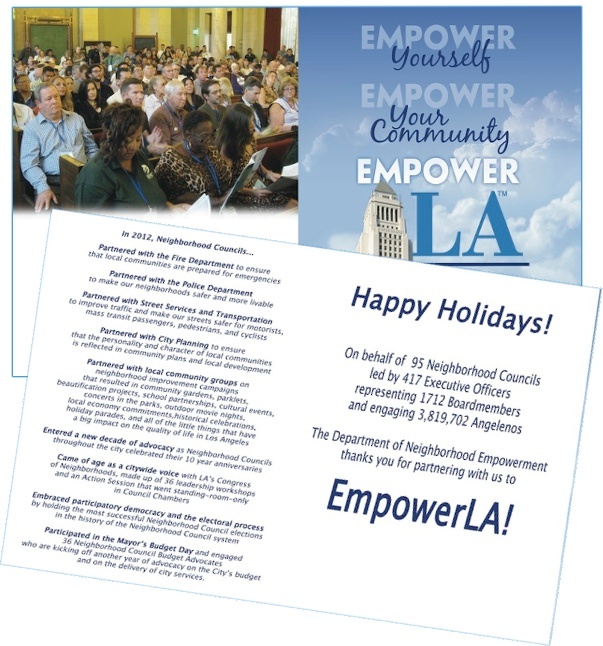 I thought we'd thank our City partners on the Neighborhood Councils' behalf by sending out these holiday cards to all the electeds and heads of City departments describing just a few of the Neighborhood Councils' impressive accomplishments in 2012. Of course, I stuck in an "I heart NCs" button with each card to those I hadn't personally pinned yet. This year, our staff really became The Little Department That Could because they've been working so hard to help Neighborhood Councils from the day to day administrative support, to keeping the funding program going, to supporting meeting operations, to holding trainings all over the City and to running citywide elections in record time. My super managers have put together some year end wrap numbers to share below, and I know you'll be proud of how your department is sprinting to keep up with you hard working Neighborhood Councils. Next year, we're looking to raise the bar even more. We'll be assisting the Board of Neighborhood Commissioners as they take on an ambitious revision of the Plan for a Citywide System of Neighborhood Councils to look at issues such as the stakeholder definition, subdivision, trainings, grievances / complaints and outreach. See below for more details on how you can be involved in this important process. We'll also be introducing new funding procedures to increase accountability and ease of use, which may even include checking accounts! This is on top of our normal field, funding, admin, outreach and policy work. Thank you so much for all that you do to Empower LA! Happy Holidays and a Fantastic New Year to you and yours! Volunteers Needed to Review the Plan for Citywide System of Neighborhood Councils!